DVD Talk's own Glenn "Savant" Erickson quipped in his 2004 review of My Fair Lady that "It's not the kind of picture that needs an introduction"...and that was more than a decade ago, folks. So, aside from lightly teasing the plot for new fans, why bother regurgitating what hundreds---if not thousands---of critics have written about what might be the most popular musical of all time (aside from The Sound of Music)? It's based on George Bernard Shaw's play Pygmalion, in which well-spoken professor Henry Higgins bets an associate that he can whip a "common girl" into the high-class shape of a duchess. His target is Eliza Doolittle, a ragged flower vendor with a strong Cockney accent and a stronger odor, whom he doggedly coaches day and night during an uphill battle that eventually pays off. The original 1956 Broadway production featured Rex Harrison and a young Julie Andrews in the lead roles, with the latter bowing out of this filmed adaptation (directed by George Cukor) to star in Walt Disney's Mary Poppins. 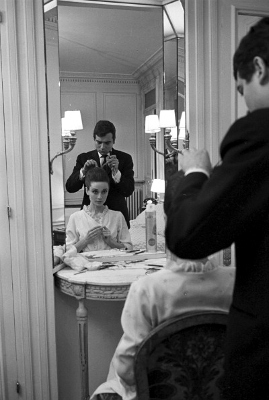 Joining Harrison in this big-screen production would be Audrey Hepburn, who had recently appeared in Breakfast At Tiffany's and Charade. For all the right reasons, Cukor's adaptation sticks very close to the source material: at just under three hours it allows plenty of time for the story to breathe, characters to develop, and most of the original songs by Alan Jay Lerner and music by Frederick Loewe to nearly steal the show. It's a deceptively simple story told in great detail, paced well and highly entertaining from start to finish. The lead performances by Harrison and Hepburn (with dubbed vocals by Marni Nixon during the song breaks) are what carry most of the weight; the rest is just icing, and there's enough here to satisfy the sweet tooth of anyone with at least a passing interest in the genre. It's been more than a few years since my last viewing of My Fair Lady, but Paramount's nearly flawless 50th Anniversary Edition Blu-ray renewed my appreciation for this classic as it likely will for most others. Featuring a picture-perfect 1080p transfer sourced from an exhaustive 8K presentation by Robert Harris (as well as a reconstruction of the original multi-channel audio presentation and a fine assortment of bonus features), this is a true total package that stands head and shoulders above most of today's lazily recycled "Anniversary Editions" churned out with DVD-era masters, dwindling supplements, and cheaply made eco-cases. Without question, My Fair Lady deserves this royal treatment, but hopefully it won't be the last classic that's resurrected with white gloves and extreme care. Easily outpacing the visually underwhelming 2011 Blu-ray and Special Edition DVD editions, this sparkling new 1080p transfer was created from a painstaking 8K restoration recently overseen by film preservationist Robert A. Harris. Not only does it present the film in its original 2.20:1 aspect ratio for the first time on home video, but the level of clarity, detail, and texture on display here is like watching a brand new film. Depth is outstanding and the film's particular color palette is represented perfectly, while a natural layer of film grain is present to remind us that excessive digital noise reduction hasn't been performed. The image is smooth and extremely natural, which will undoubtedly please long-time fans of the film; it's been said before, but it's likely that My Fair Lady hasn't looked this good since its original 65mm theatrical run (I'd say it looks even better, but that's a phrase I'll save for the film's inevitable re-issue on Ultra HD Blu-ray later down the road). For now, this absolutely flawless transfer is reason enough to purchase Paramount's 50th Anniversary edition of My Fair Lady, but there's more good news to come. DISCLAIMER: These compressed and resized screen captures are decorative and do not represent this title's native resolution. No, all "old movies" weren't presented in mono, so this new 96kHz, Dolby TrueHD 7.1 mix of My Fair Lady isn't the end result of revisionist trickery. What we get here stays true to the 65mm source, with most of the action spread widely across the front channels and what amounts to a flat (but still very much present) sound field in the rear channels. 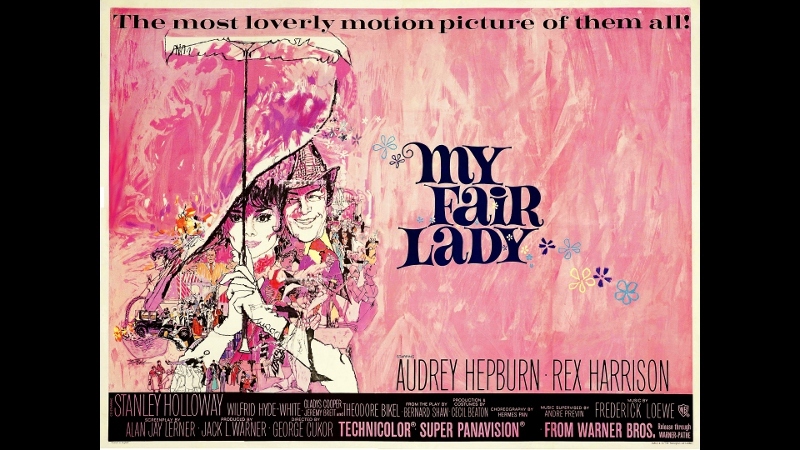 It's an effective presentation that really gives My Fair Lady a lot of charm, as the crystal clear dialogue and effects are balanced nicely with occasional music cues that don't fight for attention. Audio rarely gets equal praise in comparison to a crisp visual upgrade (after all, screen captures are easier to share), but musicals absolutely depend on a high-quality sonic treatment and this new Blu-ray delivers the goods. Optional Spanish, French, German, Italian, and Japanese dubs (Dolby mono) are included during the main feature, as well as English SDH, French, Spanish, Portuguese, Japanese, German, Danish, Dutch, Finnish, Italian, Norwegian, and Swedish subtitles. The relatively static interface is paired with dialogue and music clips from the film, with well-organized and easy to read menus that include options for audio/subtitle set-up, chapter selection, and bookmarks, while the bonus features on Disc 2 are grouped together by category. This three-disc release is packaged in a shiny and deceptively heavy) Neo case (similar to Warner Bros.' "Diamond Luxe" Blu-rays) that shines like a new penny but doesn't take up much shelf space. Obviously, no printed goodies or thick booklets are tucked inside---and I'd have preferred to see the famous poster image (above) rather than a stylized photo mock-up---but that's hardly a major complaint. There's lots to dig through here, enough to rival multi-disc editions from DVD's best years. Additionally, most everything of interest (with a few exceptions) has been ported over from the 2011 Blu-ray and Special Edition DVD packages. New to this release are a few original Production Tests introduced by actor Alex Hyde-White (son of Wilfred AKA "Colonel Pickering"); these include brief looks at "Lighting" (0:58)" "Wilfred Hyde-White's Makeup" (0:47), "Rainmaking" (0:48), a "Garden Lighting Test" (0:43), and an alternate "Higgins & Pickering Screen Test" (3:48). More production and background information is shared via two Featurettes: "The Story of a Lady" (5:06) offers a surface-level overview of the successful play and the studio's efforts to adapt it to film, while "Design For a Lady" (8:21) is a more focused attempt to detail the extensive visual elements of this production including costume design. The film's release is given more attention as well. First is footage from the January 1965 British Premiere (2:17) that highlights a few red carpet appearances. An assortment of vintage Trailers is also added, including but not limited to a teaser trailer with city tags, an "Awards" trailer, a "Reserved Seats" trailer, and a few re-issue trailers that feature promotional stills and posters. Finally, Rex Harrison is featured on-set during a brief BFI Honor segment (2:08). 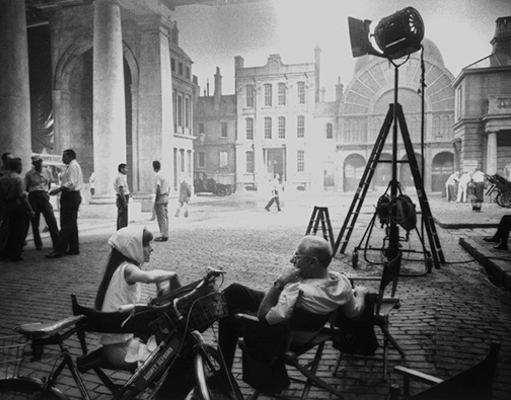 Returning from past releases is a broad assortment of extras, including "More Loverly Than Ever: The Making of My Fair Lady Then And Now", footage from the 1963 Production Kick-Off Dinner and 1964 Los Angeles Premiere, a clip of director George Cukor in action, two Alternate Audrey Hepburn Vocals, "Comments on a Lady" featuring Martin Scorsese and Andrew Lloyd Webber, a handful of Promotional and Still Galleries, a brief Rex Harrison Radio Interview, Harrison's Golden Globe Acceptance Speech, and a few highlights from the 1965 Academy Awards Ceremony. Please refer to Jamie S. Rich's review of the 2011 Blu-ray for a more detailed breakdown of these recycled extras. Missing in action are a few odd exemptions, most notably the feature-length audio commentary with art director Gene Allen, singer Marni Nixon, and restoration producers including Robert A. Harris. It's been a while since I've heard this commentary in full, but the participants' contributions were either minimal or, in the case of Harris and the restoration team, no longer applicable to this new release. It's still odd that it was ditched entirely or not updated, but I suppose it's not a huge loss. Also missing are the original 1964 trailer and another brief Harrison radio interview. Still, this is obviously a well-rounded and thoughtful collection of bonus features that does the film justice. If you're at all a fan of classic musicals, there's virtually no reason why My Fair Lady shouldn't be at or near the top of your list: it's got a classic story, great performances, terrific songs, and stays extremely faithful to the popular play it was based on. It doesn't matter if it's aged a little during the last five decades; My Fair Lady simply captures a specific period in film history that a sizable chunk of audiences will always remember fondly. There's a lot to live up to here and Paramount's brand new 50th Anniversary Blu-ray absolutely steps up to the plate, delivering a landmark A/V presentation (sourced from a new 8K scan with pitch-perfect audio) and plenty of terrific old and new bonus features. This is an essential release (whether or not you already own the 2011 Blu-ray or Special Edition DVD packages) and obviously deserves our highest possible recommendation: DVD Talk Collector Series.